Amid rumors of its impending acquisition by Walmart, Humana acquires 22-clinic Family Physicians Group (FL) as part of its primary care expansion efforts. The company is in the midst of consolidating its physician networks in South Florida and Texas under the new payer-agnostic Conviva brand – part of a strategy that CEO Bruce Broussard says is built around integrating senior-focused primary care, home and behavioral health with tech and analytics to help patients proactively manage their health. 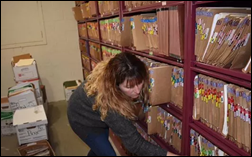 Northeast Texas Women’s Health deploys RCM software and services from EMDs to help its physician and office manager – also husband and wife – reclaim time at home, some of which had been used to catch up on billing. 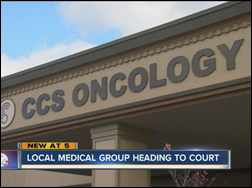 A former CCS Oncology employee is outraged after her last paycheck bounces. Denise Goff, who left the company last month, believes there are between 100 and 150 former employees who also received bad checks. The company filed for bankruptcy last week. To help practices more efficiently implement and use telemedicine, Global Partnership for Telehealth develops a tool that puts PHI, peripheral scope access, and tele-auscultation technology on one platform. Press Ganey develops surveys to help practices gauge patient satisfaction with virtual care services. A new Surescripts survey of PCPs finds that, like today’s increasingly price-conscious patients, physicians believe prescription cost should impact prescribing practices – yet just 11 percent of the 300 surveyed can access that information electronically. Respondents also expressed dissatisfaction with their ability to digitally access patient clinical histories and medication adherence data. 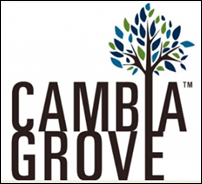 Cambia Grove launches the TRAILS Competition to offer primary care-focused health IT startups access to data and multi-state testing in primary care settings through its partnership with the University of Washington’s Primary Care Innovation Lab. First-round submissions are due April 27. AdvancedMD will exhibit at ASCRS April 13-17 in Washington, DC. EClinicalWorks will exhibit at the AAOE 2018 Annual Conference April 14-17 in Orlando. In an effort to make care more convenient, effective, and affordable, the healthcare industry has recently been shifting away from volume-based care towards value-based care. This means providers are increasingly receiving payments based on the value of care they deliver rather than the amount of treatment completed. While the push to make this move has been going on for nearly two decades, it’s only recently that the shift has really picked up steam with both government and commercial payers. Experts note that the trend towards value-based care will continue into the foreseeable future. According to a 2016 survey from ORC International, 58 percent of payers are moving towards full value-based reimbursement, and 63 percent of hospitals were part of some ACO. Those numbers continue to grow about 10 percent each year. What does value-based care mean? As with any big change, adopting a value-based care model leaves providers with questions. Many of these questions revolve around the meaning of value. How is value defined? What services constitute value? How can a practice determine if they are providing sufficient value? To understand how to implement value-based care, it is critical to know how value is defined. The following are the key initiatives payers use to determine value in a value-based care payment model. 1. Patient experience. At the center of value-based care is the patient experience. Not to be confused with patient satisfaction (which is a subjective measurement), the patient experience encompasses every interaction that can be easily measured. Measurement is key. The patient experience includes things like ease of scheduling, wait times, patient access to healthcare records, and clear communication between the patient and provider. To provide excellent value, every aspect of the patient experience should be as seamless and easy as possible. 2. Proactive care. A major goal of the value-based care model is to improve poor health outcomes through proactive care. Proactive care includes preventative care as well as on-going care for patients with chronic conditions. In days gone by, proactive care often meant simply outlining a health plan and hoping patients adhered to it. Today, practices are expected to implement specific strategies to actually motivate patients to follow those health instructions and show up for regular appointments. Proactive care starts with uncovering the reasons behind non-adherence and then removing those barriers. This often requires more touch points of communication than many practices have historically given. Proactive care strategies can include everything from appointment reminder texts to educational newsletters to video explanations of treatment to medication reminders and more. 3. Patient risk assessment. Using technology, patient data can be analyzed to identify those who have potential health risks. These are the patients most likely to have poor health outcomes and, subsequently, need proactive care. According to a recent Chilmark Research report, current risk stratification models account for only 10 percent of a patient’s health outcomes and are not sufficient to meet the standards of value-based care. These risk models focus on the needs of the practice rather than the needs of the patient. Value-based healthcare organizations should include social, behavioral, and environmental factors in their risk assessments. These social factors account for as much as 70 percent of health outcomes. 4. Care coordination. One “value” pillar that practices should examine is the effectiveness of care coordination across the entire healthcare system. Care coordination, while important for all patients, is especially critical for those patients deemed to be high risk. When care is coordinated across all specialties, practices are better able to eliminate gaps in treatment. Care coordination requires comprehensive and timely communication between all of a patient’s providers and, when done well, leads to improved care and better health outcomes. 5. Patient-reported outcomes. 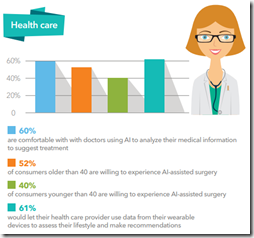 Using a combination of surveys and questionnaires, patients are being asked about their healthcare experiences more than ever. Patient-reported outcomes are defined by the FDA as "any report of the status of a patient’s health condition that comes directly from the patient, without interpretation of the patient’s response by a clinician or anyone else." It is through PROs that the more subjective information about a patient’s experience is gathered. Collecting and evaluating this information provides insights that enables practices to develop a more patient-focused (i.e. value-based) process. The shift to value-based care is often overwhelming at first, but knowing the basics helps ease the transition. The growing pains are worth it. As practices adopt value-based care, the entire healthcare system will benefit — including providers, patients, payers, and society as a whole. Value-based care reduces costs, increases efficiencies, boosts patient satisfaction, and results in better health outcomes. Dedicating the time and training needed to put the “value” in value-based care is a win-win for everyone. AdvancedMD, Drchrono, Epic Systems, NextGen, NetSmart, Modernizing Medicine, and SIS Amkai score top rankings in Black Book Research’s latest customer satisfaction survey on specialty EHRs. Oregon Oncology Specialists will implement Navigating Cancer’s patient relationship management software that includes remote monitoring and patient education, triage, and symptom management tools. 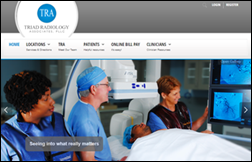 Triad Radiology Associates (NC) selects billing, coding, and practice management services from Healthcare Administrative Partners. Tyson McDowell (Lead Wingman) joins blockchain-based PHR startup MintHealth as CTO. NueHealth promotes John Palumbo to executive chairman and names Carl King CEO. App-based house call company Remedy secures an early-stage investment from JF2 Capital Partners. Before founding the Texas-based startup, founder Jeremy Gabrysch, MD spent three years as CMO at Soddo Christian Hospital in Ethiopia. Radiology practice management and technology company Premier Imaging Ventures rebrands to LucidHealth. 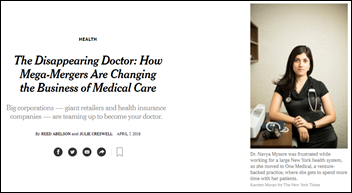 The New York Times looks at the changing landscape of primary care, highlighting the convenience-based business models of urgent care and retail clinic chains like Healthy Now (WA) and technology-enhanced models of groups like One Medical. While all eyes wait to see what the “mega-mergers” of CVS/Aetna, Amazon/Berkshire Hathaway/JPMorgan, and Walmart/Humana will mean for primary care, hospitals are continuing to encroach on the footprint of independent practices by opening up their own urgent care facilities. “Everyone is fighting for the primary care patient,” concedes Summit Medical Group CEO Jeffrey Le Benger, MD. Summit Medical has also opened up urgent cares, a move Benger refers to as being a “loss leader” for its unprofitability but importance in maintaining patient market share. Doctor on Demand leverages Change Healthcare’s Intelligent Healthcare Network to offer patients lab testing facilities based on location and cost. A man suffering from shortness of breath credits his visit to a telemedicine kiosk at a local pharmacy for saving his life. (He hadn’t been to the doctor’s in years.) Consulting from nearby New York-Presbyterian Lower Manhattan Hospital, the telemedicine doc advised the patient to check himself into the ER, where he was diagnosed with congestive heart failure, fluid in his lungs, and diabetes. 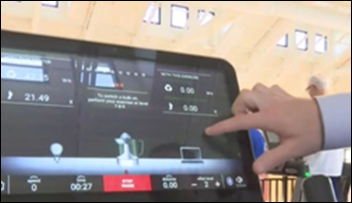 While the availability of a virtual visit was indeed fortuitous, the story is more of a cautionary tale about the dangers of missing regular health checkups. The AMA and Google launch the Health Care and Interoperability Innovation Challenge to uncover new ways of monitoring and sharing health data between chronic disease patients and physicians using mobile technology. Up to $50,000 in Google Cloud credits will be awarded to the top three winners. CCS Oncology’s financial struggles compel it to file for Chapter 11 bankruptcy. Court documents show the New York-based chain of practices will cut its physician workforce from 60 to eight as part of an overall staff downsizing from 181 to 74. The company has also decided to jettison its primary care and non-cancer practices. April 5 (Thursday) 1:00 ET. “Succeeding in Value-Based Care Via a Technology-Driven Approach.” Sponsor: Health Fidelity. Presenters: Adele L. Towers, MD, MPH, senior clinical advisor, UPMC Enterprises; Adam Gronsky, director of advisory services, Health Fidelity. Success in value-based care requires a thorough understanding of how risk-based payment models work. To prosper in this data-laden era of care, providers need to manage their patient populations holistically rather than through a collection of individual episodes and be able to accurately identify, document, and report risk scores. Given the stakes, is your provider organization adequately set up to take on and succeed in managing risk? In this webinar, learn how technology-enabled risk capture optimization is helping providers succeed in risk-based payment models. Appriss Health adds HC1.com’s zip code-based Opioid Dashboard to its PDMP technology for government agencies. 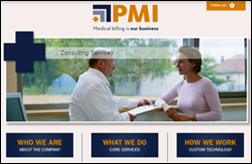 C&C Medical Administration launches Web-based coding and billing services. 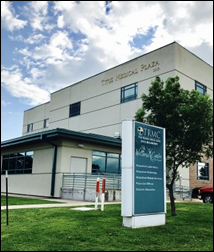 Physicians’ Clinic of Iowa will replace its Greenway Health EHR with EClinicalWorks V11. Diagnostic Professionals (FL) implements Royal Solutions Group’s Web-based patient intake kiosk and payment software across its four facilities. 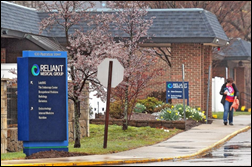 Optum wraps up its $28 million acquisition of Reliant Medical Group (MA). First announced last May, RMG CEO Tarek Elsawy said the acquisition will enable the physician group to remain competitive, and give it access to advanced data analytics capabilities. Optum won out over Massachusetts-based Harvard Pilgrim and UMass Memorial Health Care, according to state filings. Billing, coding, and practice management company AdvantEdge Solutions acquires competitor Professional Management. Former PM President Dave Nicholson will become AdvantEdge EVP. 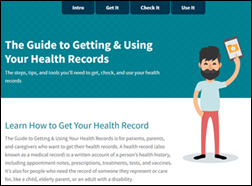 As part of the MyHealthEData Initiative, ONC publishes a consumer-friendly guide to obtaining and using digital health records. A study in Health Affairs finds a disconnect between EHR quality measurement functionality and the federal programs that link payment to such measures. An analysis of 1,500 practices found challenges with EHR upgrade delays, lack of bandwidth to prepare data for reports (or a lack of resources to outsource preparation), and software that lacked customizable measurements. AAFP will offer select members access to virtual care tools from Zipnosis as part of a pilot program before rolling it out to all members later this year. The solar-powered town of Babcock Ranch, FL prepares to open a health and wellness center fueled by energy produced during workouts. 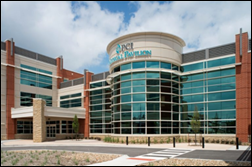 The center, which also offers physical therapy, will begin offering primary care through Lee Health’s physician group this summer. Aprima will exhibit at the OKMGMA Conference April 5-6 in Oklahoma City. Veritas Capital will acquire GE Healthcare’s Value-Based Care Division – including Centricity, RCM, and workforce management assets – for $1 billion. GE Healthcare President and CEO Kieran Murphy says the business will move forward with a focus on digital precision health solutions that include smart diagnostics, connected devices, AI, and enterprise imaging. Cary Skin Center (NC) implements patient referral coordination and communication software from Infina Connect. Practice Fusion founder and former CEO Ryan Howard (IBeat) joins MTBC as a special advisor to CEO Stephen Snyder. To my knowledge, MTBC is the only ambulatory EHR vendor offering its software to physicians for free, as Practice Fusion did before its Allscripts-influenced move to subscription pricing earlier this year. Billing company Inbox Health promotes founder Blake Walker to CEO. Payspan promotes Rob Pinataro CEO and appoints Mark Chapman (VoApps) president and CFO. Alabama becomes the 50th state to pass a data breach notification law requiring organizations to notify citizens affected by a breach of electronically stored information within 45 days. California passed the first such law in 2003. In JAMA, physicians publish a “Charter on Physician Well-Being,” offering guiding principles and a framework organizations can use to help their physicians avoid burnout. 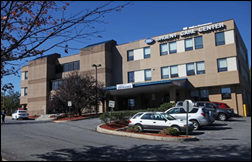 Middletown Medical (NY) alerts patients to a January data breach caused by an improper radiology interface security setting that may have allowed users to see patient listings and to access certain PHI. HealthcareNow Radio interviews Medicomp Systems CEO Dave Lareau.